Salam Fayyad took a direct slap at Abbas and said the PA is losing its bid for UN recognition while its financial situation worsens. Palestinian Authority Prime Minister Fayyad took a direct slap at Mohammed Abbas and said the PA is losing its diplomatic war for independence by asking the United Nations for recognition. He noted that the PA is running out of money. Fayyad told Reuters that the Palestinian Authority is “losing the argument, if we have not already lost” it. Abbas last year tried to do an end run around talks with Israel for the establishment of the PA an independent country and instead went to the United Nations Security Council, where he needed the support of two-thirds of its 15 members to back recognition. Realizing that he was one vote short, Abbas withdrew his motion. If it had been passed, the proposal faced a veto by the United States, which would have prevented the motion from being forwarded to the pro-Arab General Assembly, where the Palestinian Authority is guaranteed a majority. Fayyad, an American-educated economist who was hand-picked by the Bush administration for his position, is considered an outsider by Abbas’ ruling Fatah party, and Abbas and Fayyad have been at odds several times. Fayyad also said that the Palestinian Authority is in dire financial straits, which is nothing new except that the European continent faces a recession and economic disruptions in debt-ridden countries such as Greece. He charged that Israel has succeeded in making the Palestinian Authority seem trivial, but mainstream media have lately become tired of the moribund "peace process" and Abbas' saying he wants Israel to sit down for “negotiations” while insisting that all of territorial and political demands be accepted without changes. With the Palestinian Authority divided by its rival Hamas terrorist organization ruling in Gaza, Fayyad departed from the standard Abbas line and said that unity is needed before the Palestinian Authority can claim independence. Abbas and de facto Gaza Prime Minister Ismail Haniyeh have declared unity several times but have not followed up with practical steps. 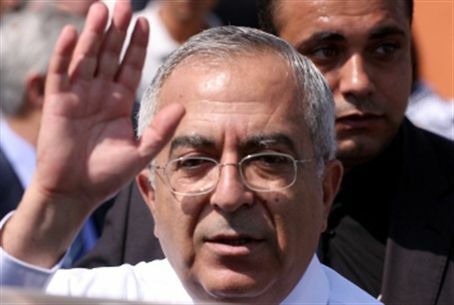 Fayyad’s call for new elections was implicitly critical of the Fatah leader. Abbas has served seven years as chairman, two years beyond the date for elections that never took place.